This is the wiki page for the upcoming 7th Workshop of the Open Energy Modelling Initiative, a grass-roots organization of modellers from various research institutes, universities and companies. The workshop will take place in Garching/Munich, Germany hosted by the Chair of Renewable and Sustainable Energy Systems of the Technical University of Munich (see Events for previous workshops). The workshop will take place on 12-13 October 2017, with an optional tutorial day before on 11 October 2017. Since the workshop is run by volunteers, there is no registration fee, so feel free to join! This wiki page will be updated frequently with a programme and practical information. All participants are invited to contribute suggestions of different sessions to be included in the programme. In the meantime, feel free to register on the forum or mailing list where all things regarding energy modelling are discussed. Getting there: The chair is located outside of Munich at Garching Forschungszentrum, which is the last station in the north of the subway U6. Depending on where your hotel is, it can be up to 45 minutes to get from the city center to the campus. Our institute can also be reached by car, there are parking possibilites at the campus. 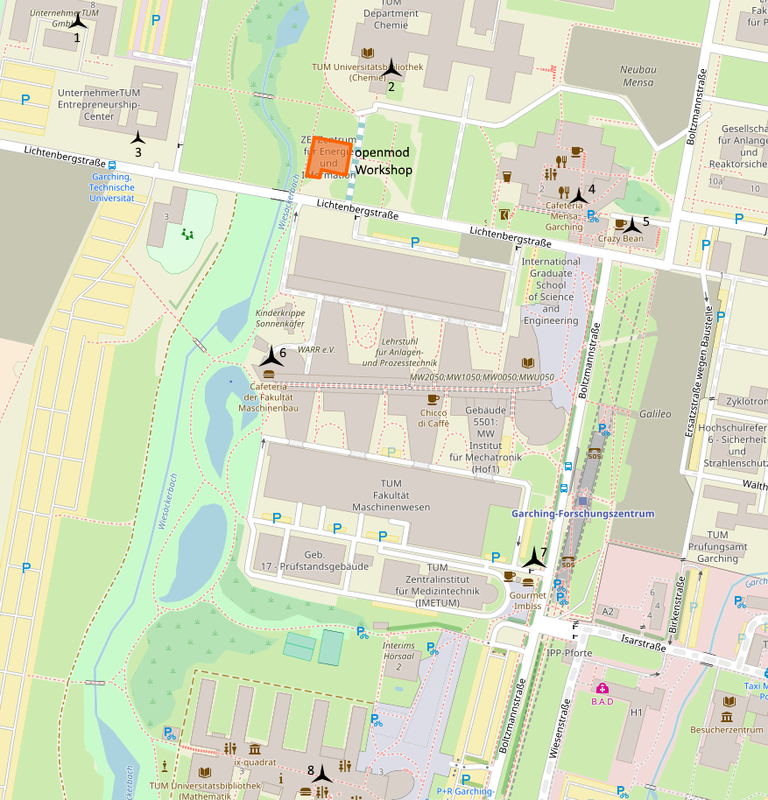 Accommodation: If you want to travel to the campus by subway, try to find a hotel near the U6, as the public transportation network is centralized and there are only limited connections between the outer parts of the city. If you arrive by car, ensure that the hotel has parking opportunities or look for hotels outside of Munich, since parking is most of the times an issue in Munich. For bookings, try airbnb, booking.com or HRS. Registration is now closed. There are only 65 places for this workshop, so any additional registrations will be on the waiting list. Everyone who has registered will be visible on the participant list (without email addresses). On the day before the main official workshop, optional tutorials will be organised for students and researchers who are new to scientific computing and energy system modelling. The tutorials will be split into two streams: "General Scientific Computing" and "Advanced Topics". Each stream will take place in separate rooms at ZEI, each of which has a maximum of 25 places available. For the oemof tutorial you need to have a running Python 3 environment. Secondly you need to install oemof and a solver. The following list explains how to do this. You'll find detailled information when you follow the links. If you have any questions or things are not working as expected please use the Q&A section in the openmod forum with tag #oemof. 2. Once installed, perform the steps for First-Time Git Setup from https://git-scm.com/book/en/v2/Getting-Started-First-Time-Git-Setup. The other two options are either inconvenient (option 1) or too disruptive (option 3) for my taste. For all other screens, simply stick to the (sane) defaults, unless you know you prefer a non-default setting. "conda env create -f requirement_oep-api.yml"
This stream contains lectures introducing energy modelling frameworks. In addition for breakout groups: seminar rooms 0002, 0003, 1002, 2002. The workshop is organised from and for modellers and stakeholders of the open energy modelling community who want to exchange and discuss about energy models, code, data, licenses, transparency, making results understandable to stakeholders, campaigning for open data, etc. If you are interested to discuss a special subject you can propose breakout groups on the google sheet. Please communicate your ideas for new breakout groups and add your name to a group that you would like to join. You can add suggestions for the content either in the table or as a comment. If you want to give a short presentation during the workshop (4 mins + 2 mins questions), e.g. a model introduction, please mention that when you register. This page was last modified on 1 November 2017, at 11:33.